Gods of the Japanese people reside within true natural beauty. If you’re a nature-loving traveler wandering through Japan, Kamikochi is a place you can’t miss. Located in the Nagano Prefecture-side of the Chubu-Sangaku (or literally, “Central Mountains”) National Park, Kamikochi is one of the must-see scenic sites in Japan. It was first introduced to the world by an English missionary and alpinist Walter Weston, who named it the Japanese Alps for its mountainous beauty. Kamikochi has been an important place for mountain worship and the Japanese people have viewed it as a place where the presence of God can be felt with the sunrise. That is where the name Kamikochi comes from: Kami (God) – Kou (descend) – Chi (place). The most popular way to approach Kamikochi is by the seasonal shuttle bus, which is available throughout spring to fall. It ends by mid-November, and all hotels and shops in Kamikochi stop their service for the winter. It “closes” itself as a tourist spot, so most people think Kamikochi is unapproachable during the snowy season. This is true in some ways; since Kamikochi is situated at the altitude of more than 1,500 meters, it is covered in deep snow during the winter and it’s not rare for the temperature to drop to below minus 20℃. Quiet walkways can turn into avalanche paths and if you don’t study the weather closely, blizzards and whiteout can get you stranded in the wilderness. Kamikochi in the winter is not a tourist resort; it’s a mountain to climb. And to top it off, the Japanese Ministry of Environment is reluctant, for the sake of conservation, to let a lot of people wander around Kamikochi in the winter; that’s why there aren’t a lot of information on winter Kamikochi disclosed in the first place. But it’s not a prohibited area. So how do we get to this beautiful hideout in the winter? Go with someone with proper equipment, knowledge, and experience to guide you through the way. As with all mountains, it’s not impossible for individuals with adequate knowledge and experience to enter the area in the winter on their own, but for travelers with little or no experience in climbing winter mountains, the risks are high. If you take a guided tour, though, your guide can give you a ride to Nakanoyu, the closest place you can get by car to Kamikochi. Where is that Genuine Natural Beauty we all seek? If you look around the world, there are lots of famous tourist destinations with beautiful scenic sites. In Japan, for example, the UNESCO World Heritage site Shirakawa-go and Sapporo Snow Festival are popular places to see in the winter. It’s true; the beauty created by the local culture and the people living there is worth seeing, but there’s nothing more awesome than the beauty created by mother nature. And you simply can’t see the real picture of true nature in a place with easy access by bus or train; easy access means land development, concrete, artificial noise, and a place crowded with tourists. Kamikochi in the winter, on the other hand, is a perfect place for genuine natural beauty: no bus during the winter, 2-kilometer walk of a long uphill tunnel, and an additional kilometer to Taisho Pond in Kamikochi keeps unprepared tourists away, leaving Kamikochi area completely undisturbed. Like winter Kamikochi, a place you can reach only by walking is where true beautiful nature awaits. From Nakanoyu bus stop, the closest place from Kamikochi you can get to by car, it’s about a 60- to 90-minute walk to the Taisho Pond, one of the best scenic spots in Kamikochi. There’s a long uphill tunnel on the way, but it shouldn’t be a problem for those who exercise daily. If you take a guide with you, he/she will take proper safety measures, support your walk by giving advice on things like walking skills to ease your way, and keep you excited, sharing with you the history and nature of Kamikochi. Scenic spots usually attract a lot of people, but that’s not the case for winter Kamikochi. It’s still a “hidden” place; not many people know that the quiet scenery of Kamikochi during the season is a place free of artificial noise and surrounded by the breathtaking panorama of winter Japan Alps. This solitude beauty is what originally moved Weston; bathing in this awesome landscape, you’ll notice that your mind is freed from the daily clutters and at the same time your senses sharpen to feel the genuine air around you. Why not share your time at this beautiful winter Kamikochi with your family, friends, and partners? Kamikochi is potentially the most beautiful place in Japan during the winter; it’s just that there isn’t enough information in the general public to be named so. So those reading this article is lucky. Spending time with your loved ones at this awesome scenery can be a lifetime experience, and surely will be an object of envy for those who couldn’t go with you. The fact that the fascinating view can only be seen in the icy cold solitude of true winter mountains just makes the experience more bonding and memorable. A snowshoe is a footwear designed specifically for walking in deep snow. Its large footfall area distributes the weight of its wearer so he/she does not sink in the snow, creating a “floating” sensation. They also have spikes on the bottom to keep you safe from slipping on icy slopes. 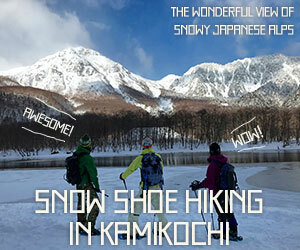 How about giving a try to a snowshoe adventure to the snow-covered woods of the winter Kamikochi? The concept of Kamikochi snowshoe tour by Guesthouse Raicho is to “Restore Yourself” – our tour plans will not make you hurry so that our guests can fully breathe the fresh air of genuine nature in Kamikochi. We also take enough time at the best scenic “instagrammable” spots and time to play with snow. The snowshoe tour content designed to satisfy the needs and wants of travelers from abroad has attracted about 50 non-Japanese tourists last year; the famous YouTuber “Maomao TV” from Taiwan is one of them. A fully experienced guide officially certified by the Japan Mountain Guide Association will accompany with you on the tour, looking after your safety and smile. Group tours, in general, are usually conducted in large numbers ranging from 8 to 10 participants, however, the tour of Guesthouse Raicho is held with a maximum of 5 (minimum 2 participants). A private tour of 1 to 8 participants is also available. The guide will consider the safety and physical ability of each and every participant, so the tour will be safe and relaxing for even the most inexperienced visitor. The private tour is receiving positive feedback, especially from families and couples. Children over the age of 6 can participate*. * Children of elementary school age (6 – 12) can only participate in private tours. This is to ensure that the guide can properly attend to their safety. A 1-day tour to and from Kappa-bashi, which is a 7 – 8 hours’ roundtrip walk, was the standard course for the last winter season Kamikochi tour; this year, we made it a lot easier for those who aren’t used to walking that long. We found that our guests are pretty much satisfied with Tashiro Pond located along the way, which is actually the most beautiful spot during the tour, so this coming season, we’re going to make the round trip tour to Tashiro Pond our standard tour course. A half-day morning trip will leave you with a comfortable sense of achievement; Guesthouse Raicho is the only place to provide half-day tours to winter Kamikochi. ・No Heavy Gear Required: Rent ‘em All! Expensive and heavy gears that may hinder your vacation are not required at all. You can rent all necessary equipment including mountain wear fit for snow, winter boots, gloves, snowshoes, poles, goggles, and headwear at Guesthouse Raicho; please contact us for the availability of children’s equipment rentals beforehand. Of course, you’d want to communicate with the guide in your native tongue; we have tours available in both English and Chinese language, the latter being available only at Guesthouse Raicho. Contact us more than 1 month prior to the tour. During the tour, either a cup of original homemade soup by Guesthouse Raicho or hot drinks like Alpscity Coffee, a local coffee brand of Matsumoto, will be served to keep you warm. ・Have a lot to see in Japan with little time? No Problem! For those who have limited time to stay at Kamikochi or Guesthouse Raicho, a day’s trip starting and ending at Matsumoto Station or Takayama Station can be arranged. If you can get on the first bus of the day from either of the two stations (which leave the respective stations at 7:50 in the morning), we can meet you up at Nakanoyu Bus Stop around 9:00 and start a half-day tour of Kamikochi. We’ll schedule the tour in time for you to get on the returning bus, which leaves at around 12:20. If you’ve made reservations for renting gears for the tour 2 days beforehand, you can join us empty-handed. You can also leave your luggage to our staff during the tour. If you plan to travel from Matsumoto to Takayama or the other way around, stop by us! You can enjoy the beautiful winter Kamikochi in the morning and tour around either of the two cities in the afternoon. 短Makemost of your stay in Japan! I stayed at Guesthouse Raicho for a week in March 2018 and enjoyed skiing, snowboarding, and snowshoeing at Kamikochi and Norikura. The snow-covered landscape of Kamikochi was fantastic, and I was able to take in the awesome view of the winter mountains all by myself; no one else was there. The tour of Guesthouse Raicho was satisfying; they can conduct the tour in Chinese, so I was able to learn about the history and nature of Kamikochi to the full extent. The price of staying at Raicho is reasonable, so I was able to have a relaxed time and at the same time take part in a lot of activities. I plan to stay at Raicho for another week sometime this year and visit Kamikochi again. It was like I’ve come to a world of fairy tales when I saw the mountains of the Japan Alps at the end of a long tunnel. I couldn’t hold back my tears; I didn’t know there was such a beautiful place in the world. Joining the tour was easy since I rented all the winter gears at Raicho at a reasonable price. Our tour was a private one with only my friend and I, so we were able to learn how to walk with snowshoes at our own pace. The winter Kamikochi is like a place in dreams for people of Malaysia and other countries where it doesn’t snow. Visit Kamikochi; it’s worth it. The Alps in Europe is beautiful, but it’s easy to get there by gondolas so it isn’t special. Kamikochi, on the other hand, was free of people and artificial things, and above all, beautiful. It’s not hard to understand the Japanese philosophy of cherishing nature and feeling God’s presence in the beautiful landscape. The tour by Raicho looked after its participants quite nicely. The guide paid attention each of us participants and took adequate rests along the way, and coffees were served to relax us. The tour itself was done in small groups, so we were able to walk at a comfortable pace. We learned about Kamikochi and the culture of mountain worshipping in Japan with the guide explaining all that in English. I would definitely recommend going to Kamikochi in the winter to my friends in Europe! * Adult fee will be applied for those of age 13 or more. Participants must be 6 years of age or more. Tours for families or groups of more than 5 people will be conducted as a private tour. In this case, there will be no additional charge for making the tour private. For groups of more than 8 people, the tour can be held by dividing the group into 2 subgroups. Each subgroup will be lead by a guide. For guests who will be staying at Raicho for 2 or more nights and participate in a tour, pickup service from Shin-Shimashima Station (the nearest train station) or Matsumoto Interchange Bus Station (the nearest highway bus station) will be available if they cannot make the last bus from Shin-Shimashima Station to Norikura which leaves at 17:25. For example, you might want to contact us beforehand for this service if you are arriving at Chubu Centrair International Airport or Haneda Airport early afternoon and planning to come to Raicho on the same day. Please note that this is eligible only for guests staying for 2 nights or more. Those who have participated in the Kamikochi Snowshoeing Tour will be given a 20% discount to the price of participating in the Night Snowshoeing Tour, which fantastic icefall lit-up during the night. For those who have made reservations by the end of November 2018, a special discount of 500 JPY (adults and children alike!) will be applied for Guesthouse Raicho’s Kamikochi Snowshoeing Tour on weekdays. Additional fee for making the tour private for groups of 2 – 4 participants will also be discounted to 3,000 JPY (a 1,000 JPY discount). This special offer is limited to the first 10 reservations, so be sure to fix your plans early! * Please note that the discount is available only for tours from Monday to Friday. For the booking, please click below.